Clean up the Space Pirates! Time: The age of space colonialism. The dreaded Klaptons are on the loose, turning peaceful settlements into ghost towns. Searching for the price on the Klapton's heads come the cosmic bounty hunters RODDY and CATHY. Do these two have what it takes to save the universe? Can they work together without competing for the rewards themselves? Their fate, and the fate of the free universe is IN YOUR HANDS - the legendary team known as TOP HUNTER! 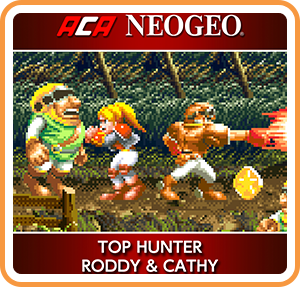 Where can I buy ACA NEOGEO TOP HUNTER RODDY & CATHY physical/digital?